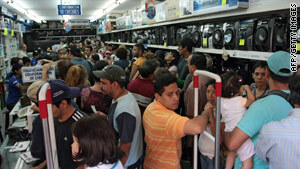 People crowd a store in Caracas, Venezuela, on Saturday, after the nation's currency was devalued. Chavez: "There is absolutely no reason for anyone to raise the prices of anything"
(CNN) -- In the wake of his decision to devalue Venezuela's currency, President Hugo Chavez on Sunday said he would put the military on the streets to ensure that business owners don't raise prices. Speaking on his weekly television program, "Alo Presidente," Chavez railed against merchants who re-price their items in reaction to Friday's announcement that the Venezuelan bolivar currency, which had been fixed at 2.15 to the U.S. dollar since 2005, was devalued to 4.3 to the dollar. For food and medicine, Chavez announced a second fixed exchange rate for these "necessity" goods at 2.6 bolivares to the dollar. "I want the national guard in the streets, with the people, to fight speculation," Chavez said, calling re-pricing a form of robbery. A devaluation makes foreign products relatively more expensive for domestic consumers, discouraging imports. Chavez showed a photograph in a newspaper of consumers in long lines over the weekend to buy goods, fearing that the sharp devaluation could result in higher prices. The president blamed such lines on "teleterror," saying that opposition media outlets were fueling a panic. "At this moment, there is absolutely no reason for anyone to raise the prices of anything," Chavez said. He encouraged people to publicly denounce businesses where prices increase and threatened to expropriate businesses that do. The government would transfer ownership of such businesses to the workers, Chavez said.